At a short ceremony on May 7, Pastor Karlson Samuel presented the gift to the president of the society, Patricia Cumberbatch. âWe are happy. Itâs a joy in our hearts to be able to assist people with disabilities and it is our means of showing how much we care,â Samuel said. Cumberbatch, in turn, expressed her appreciation for the monetary donation, as it will benefit the society in many ways. âIt is a pleasure and privilege to have you partner with us and help persons with disabilities to get a message across,â she declared. The president said that the society offers many types of programmes for the development of persons with disabilities, including home economics, computer training and adult education. âDisability is not inability,â Cumberbatch said. âPersons can learn, they can earn and they can grow, if they just give us a chanceâ. Each year, the Calder Seventh Day Adventist Church hosts a service for persons with disabilities in November, which is also Disability Month. 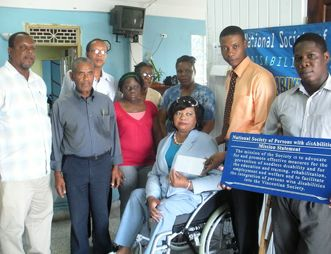 The church has been making donations to the National Society of Persons with Disabilities since 2005.